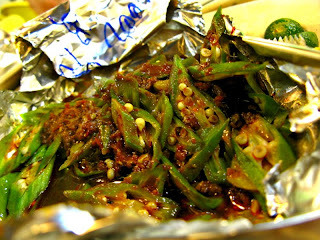 Anyone here likes spicy food? I bet there are! Well, lots of local stalls serve Portuguese Grill, usually seafood. 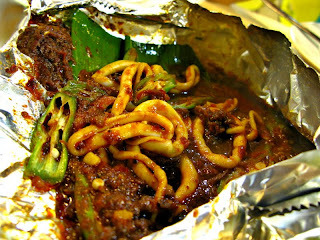 They'll wrap the seafood of your choice in aluminum foil with their own spicy sauce then take to grill. 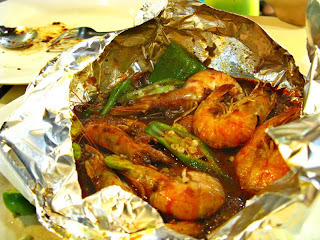 Not only the seafood freshness is important, the spicy sauce plays a HUGE role in this dish. Many I've tried, a lot of them don't keep their seafood freshness up to standard, and most of them did the spicy sauce very bland. *I know I know... you must be thinking I'm hell of a ladies finger huge fan. But NO! not me! it's my mum! *note: it's a public holiday where most people aren't here. you should visit during the weekdays then you'll know how PACKED it is. 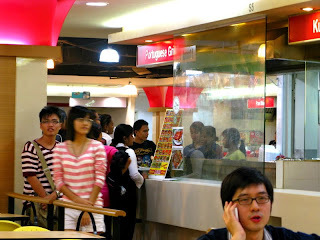 In terms of price in these kinda places (food court), a lil' pricy though... but yea... it's seafood. So, it's pretty much expected. How was the taste of Portuguese Food? yea i know this and i tried before.